Who doesn’t love barbecue? Juicy, slow-cooked meat smothered with sauce… oh it’s so good. 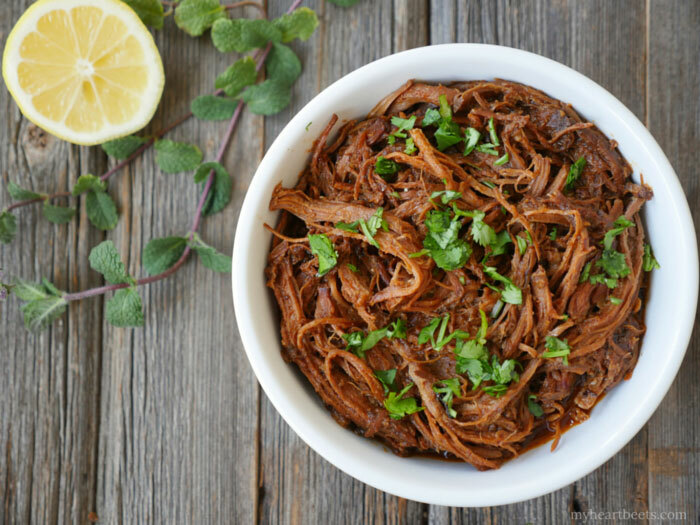 Well, all you barbecue lovers are in for a treat because this Indian-Style Pulled Pork is going to be unlike any barbecued pulled pork you’ve had before. Like all great barbecue, the secret is in the sauce. This tender, slow-cooked meat is covered with a thick tomato-based sauce prepared using Indian spices and sweetened with honey. To make the sauce, you have to first caramelize the onions – get them realllly nice and brown. This will add so much flavor and will create the base for the spiced tomato sauce. 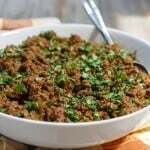 This recipe also calls for my homemade meat masala, made with cardamom, cloves, fennel seeds, cinnamon and black pepper. Trust me, after you make a jar of this spice, you’ll use it ALL the time. 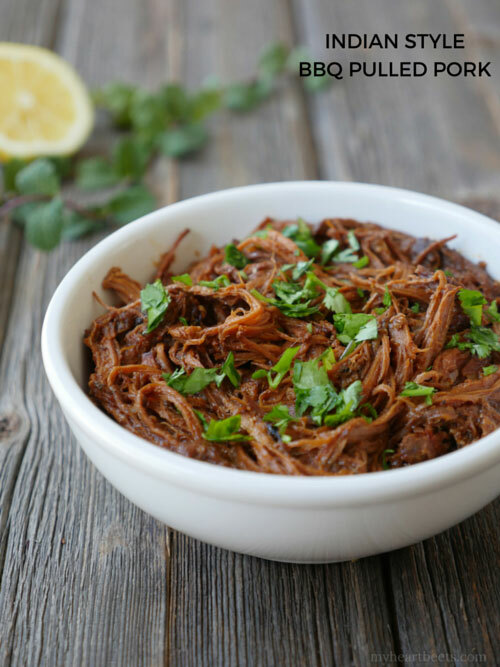 I made this pulled pork in my slow cooker – because I don’t own a smoker or a smoke pit and turning on my oven for hours in this heat just wasn’t going to happen. I put the pork shoulder roast in the slow cooker and seasoned it well with salt, pepper and a bit of turmeric. Once my sauce was done, I poured it all over the roast. A few hours later, I found myself with plenty of perfectly cooked, pullable pork. Make this, love this and impress your friends this summer (or any season) with delicious and different barbecued pork. 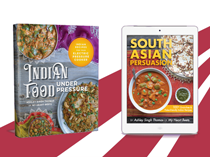 Want more tasty Indian recipes? 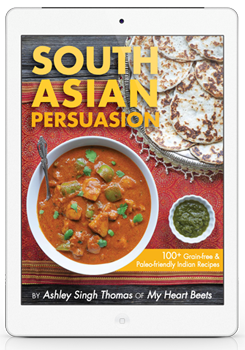 Then check out my eBook: South Asian Persuasion: 100+ Paleo Indian Recipes. 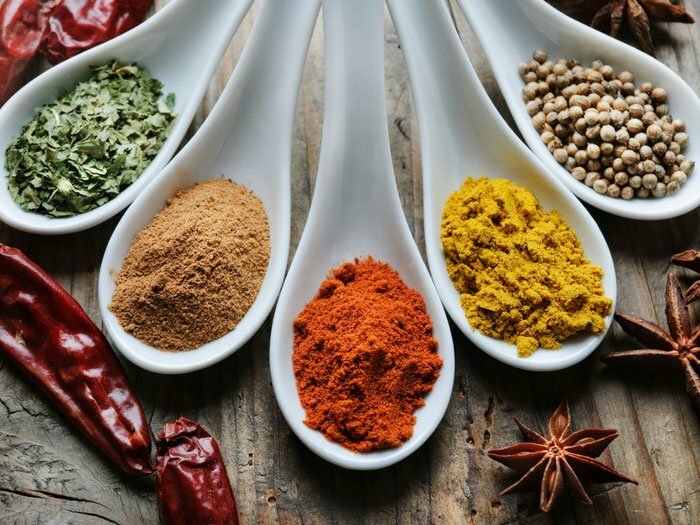 Put the pork in the crock pot and season both sides with salt, pepper and turmeric – let it sit while you prepare the sauce. Heat 2 tbs ghee in a pan and add red onions. Once the onions turn brown (realllly brown), add ginger, garlic, and the spices. Stir for a few minutes. Add the can of tomato sauce. Stir for about 5 minutes and then stir in the honey. Add ½ cup water to the sauce and then dump the sauce on top of the pork in the crockpot. Cook on high for 4 hours (or low for 6-8 hours). 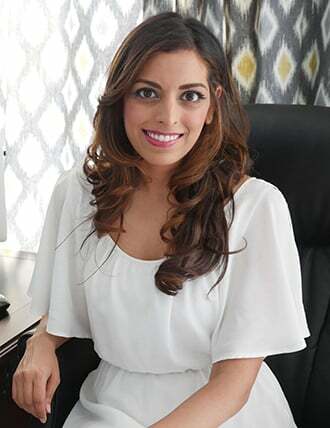 I just wanted to say Thank You for creating Indian Paleo recipes. I can’t wait to try them. 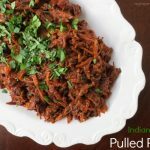 Ever since I started Paleo I’ve been wanting to create Indian Paleo recipes but now I’m so glad to find that you beat me to it! Looks so good! I would definitely make a whole bunch of this for leftovers during the week. 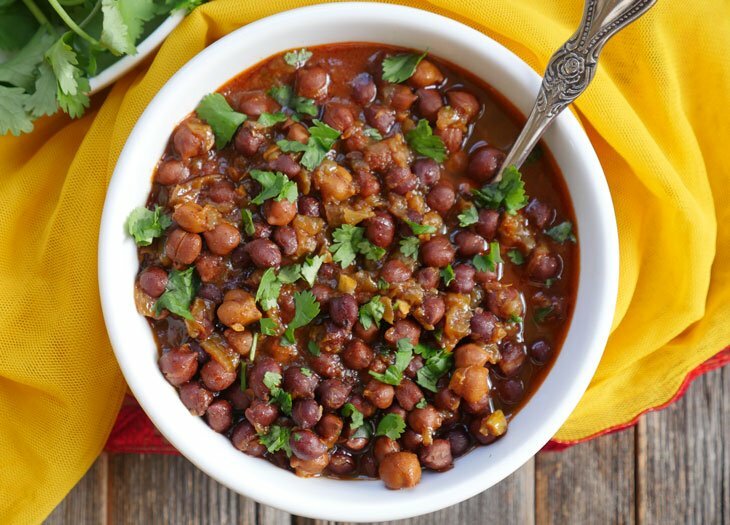 All of your recipes look so delicious, but this one is calling my name right now! I am pregnant right now and I have been CRAVING everything pork and spicy. Thanks so much for creating this! This looks amazing Ashley. Love the unique flavors. I bet it is so delicious. MMmmmmm that looks DELICIOUS!!! I’m definitely going to have to try this out! This looks so flavorful! Can’t wait to make it! 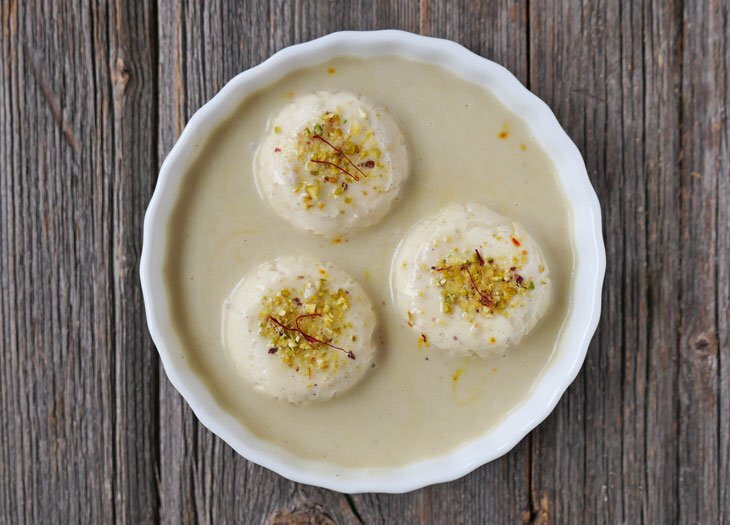 Dust this recipe off for the winter months! 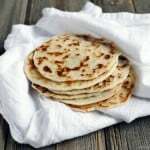 A perfect and simple recipe for these extremely cold days and perfect with your 3-ingredient naan…. This looks so good! 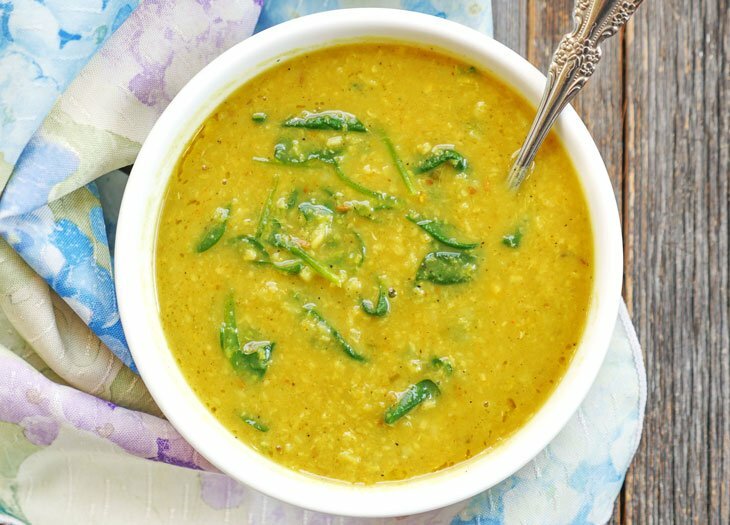 Have you made this in the Instapot? I’m new to the Instapot and wonder which buttons to use for this!! Lisa, I haven’t but I’ll have to try at some point! It’ll probably be awhile though because I just made this dish late last week and we’ve got leftovers in the freezer right now. 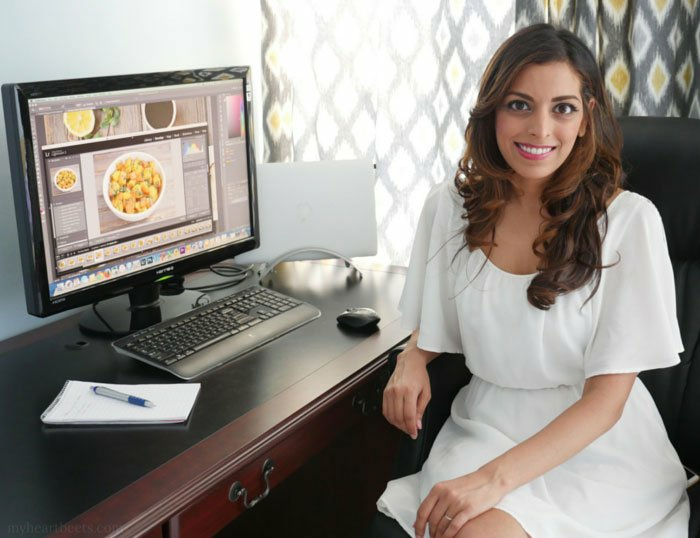 I’m sure the Instant Pot would be easier to use than the slow cooker – because you’d be able to make the sauce right in the Instant Pot. Just press the “saute button” and then follow the directions for the sauce. Then, press “cancel” and add the pork shoulder. Once the meat is in, click the “meat/stew” button. I’m not sure how long it’ll take to cook but if you try, please let me know! I was looking at this and another one of my indian cookbooks and I had an idea. What do you think about adding some vinegar (maybe 1/4 cup) to this to make it vindaloo-ish? A lot of southern bbq sauces use vinegar anyway. My parents (both almost 70) recently tried Indian food at a restaurant, and they really enjoyed it. My brother loves Indian food. He wanted me to introduce his youngest kids (14 and 15 years old) to Indian food. So on my trip home to visit them all last week, I made this pulled pork, saag paneer (gave them all real paneer and just left it out for me), and aloo filling (no access to an oven, so no samosas), plus tamarind chutney all from your book. Rave reviews all around! They especially loved the pork. It is amazing! I made a batch overnight last night for me now that I’m home. This is hands down my favorite pork recipe ever. Katherine, that’s so great to hear!! I’m so glad you like the recipes and that you shared them with your family 🙂 Thank you so much for letting me know how they turned out for you all!! 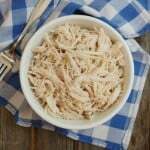 I have made many of your wonderful recipes and this one is a favorite. I normally make a cauli rice side, but am wanting to try something new. What would you suggest for this puled pork? After the pork is done, there’s a lot of liquid. What do you suggest? Boil it down and add it to the pork? Yes, if the pork released too much water, then definitely cook it down. Let me know how it turns out for you! I just randomly came across this post and the title was so intriguing! What a great flavor combo! I’ll be trying this at some point this summer! 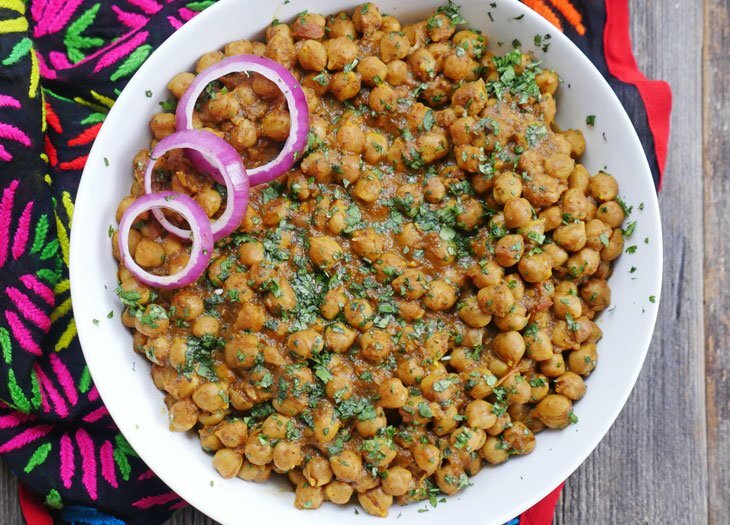 I haven’t made this yet because I have a question about the Homemade Meat Masala. 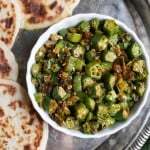 I see where you are to toast the green cardamom pods (which have those lovely fragrant black seeds inside the fibrous green pod) then you grind it all. Do you grind the GREEN CARDAMOM PODS that are the fibrous hull along with the seeds inside the pod? Or do you crack open the green pod and just grind the black seeds with the other spices? Thanks Beatrice! Yes you grind the green portion along with the seeds for this masala recipe 🙂 I can’t wait to hear what you think!